Electric dirt bikes are ideal for urban areas where noise may be a problem and for beginners/children starting out, as electric dirt bikes have the ability to electronically adjust the level of speed. Our range of GoSKitz electric dirt bikes have a max speed of 22km/h. Here you can find the best Go Skitz 2.5 Electric Dirt Bikes for the cheapest prices online in Australia. 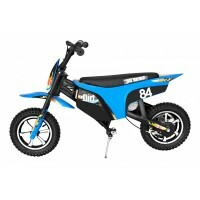 Our Go Skitz 2.5 electric Dirt Bike is a perfect match for riders on all skill levels who love the c..